Nonprofit organizations are an essential component of my public relations and marketing company. For anyone uncertain of the power of PR, I wanted to share a success story on my most recent client. I first met the folks from the Danny DeGennaro Memorial Foundation in August, about two months before the organization’s second annual Creative Inspiration concert. For background’s sake, the nonprofit organization formed in 2014. Its mission is to carry on the legacy of the late Danny DeGennaro, a Bucks County musician who was murdered in his Levittown home in 2011. In honor of DeGennaro, who had a long career with the Grateful Dead-esque band Kingfish, the Foundation fundraises to provide scholarships for student musicians at Bucks County Community College. The Creative Inspiration concert is an integral fundraiser. Ed Mero, president of the Foundation’s board of directors, contacted me to see how Katalinas Communications could use its public relations expertise to generate media coverage and increase awareness. At the time the foundation contracted with my company – approximately six weeks before the concert – the only attention the nonprofit had received had come in the form of paid advertising in a regional entertainment publication and radio spots on partner Bucks County Community College’s radio program, Radio Bux. 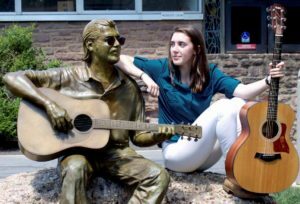 Emma Spies, the 2016 Danny DeGennaro Foundation scholarship winner, poses with a sculpture of Danny DeGennaro at Bucks County Community College. In the days and weeks leading up to the event, I worked to build the Foundation’s earned media (i.e. unpaid) coverage repertoire. I arranged for four radio interviews between broadcast reporters and student scholarship award recipients, Foundation representatives and friends of DeGennaro. Thousands of greater Philadelphia area listeners heard the interview and acoustic performances from the Foundation’s 2016 scholarship award winner Emma Spies at CBS Studios as part of the Philadelphia Agenda radio show. KYW Newsradio 1060 also aired an interview with organizer Aurora Hill, highlighting the fundraiser. Bucks County Community College student musician Alexa Korogodsky performed live during two different segments on WNPV 1440 AM and shared how the Foundation has supported her and her band in terms of funding recording studio time. Spies, Korogodsky and Foundation representatives were interviewed for articles which appeared in multiple Bucks County, New Jersey and regional print and online publications, including the Times of Trenton and LevittownNow, among others. A day before the Oct. 22 Creative Inspiration concert, Mero thanked me for my public relations company’s efforts. For more information on how Katalinas Communications can help your nonprofit organization gain the media attention it deserves, email Theresa Katalinas at theresa@katalinascommunications.com or call 215-519-8833.